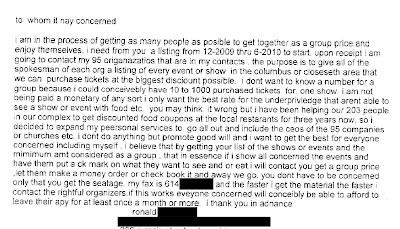 This is a scan of a letter that we received at work via fax. I have covered up the bits that would reveal the name of the lunatic that wrote it. I mean, you'd have to be crazy to send this letter out in its current format. I can't figure out what on earth he/she/it is talking about other than purchasing tickets. Obviously this person is a foreigner, but that is really all I can understand. that's pretty fantastic. Took me a while to figure it out as well. M, I'd bet dollars to doughnuts that it's not a foreigner. The real question is, how did a request for group rate information come to you? After scrutinizing completely and drawing my own conclusions as to what they are saying alls I can say is....I am TOTALLY onboard!!!! Please forward the info to my email. This isn't going to work, Joseph.